Not Just for Animals Anymore! These feed buckets with lids are just like their lidded-bins counterparts inasmuch as they are great for long-term storage of your dehydrated foods. 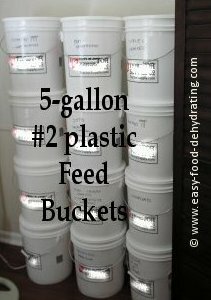 These 5-gallon #2 plastic food grade feed buckets are fantastic and can easily be stored in a closet, walk-in pantry, or your garage. Store buckets together that have the same kind of food items inside, such as flour and bread yeast next to each other; and sugar and salt side-by-side. Veggies in another 'column' etc. Another thing: Safety First– leave the HEAVY buckets on the floor, or at least on the lower shelf. You don't want to be hit in the head by a full bucket! :-) (Note: These are readily available at your home building center or farm feed supply stores). When you have your buckets filled with your Mylar bags which should have their contents and the date written on the bags, it's time to do the same on the outside of the bucket and date it! For Feed Buckets with Lids: Gamma2 Bucket Lids that Screw Out! NOTE: I came across these great Gamma2 lids at Amazon (see the links below). The Food Grade plastic pails (buckets to me!) are also from Amazon.com – that's a good price for fourteen of them (though the reviewer didn't rate them so well) ... basically, we're looking to store our filled Mylar bags in bulk. So the buckets with handles makes it easy to move 'em around. But back to the bucket lids, you (gently!) 'hammer-on' the 'rim' and then you can simply screw-out the center part! One reviewer said it kept her flour etc. totally bug-free – as they really are air-tight! No more losing finger nails and hurting your finger tips trying to pry lids off, especially in cold weather ... ouch! We also use grey buckets from our favorite home improvement store and these cost slightly less than the white ones shown. Don't forget to add a 2000cc oxypack! twice a year, for stock rotation.